"young IE offshoot (Romance) has replaced pre-existing Indo-European (Italo-Celtic) variation." Probably Celtic(ultimately result of the migration of the ie group of lislakh[indo-hittite+north afro-asiatic]peoples of southern Anatolia=>çatal höyük plain,one of the first agriculture sites in the world)itself replaced(linguistically and not geneticaly)pre ie languages of autochtonous Europeans coming from Vasco-Caucasian speaking northern Anatolia(Khattis,Hurris,Gutti...) (Ligurian,Iberian,Aquitanian,Vasconian...). Also Celtic most likely is the result of those autochtonous Europeans adopting an ie speech. The Mari Mountain outlier is quite notable. This community has retained distinct population genetics and relatively vibrant pre-Christian religious beliefs. The earliest historic attestation of them is in the 5th century around the time of Uralic expansion. Are they a proto-Uralic relict? Or, an earlier stratum that was not historically documents since they were so far from the literate world? The closeness of the Sami to the Georgians is also notable. The two are at the opposite extremes of former Soviet Europe, and do not share a language group, but are populations least marked by recent immigration. 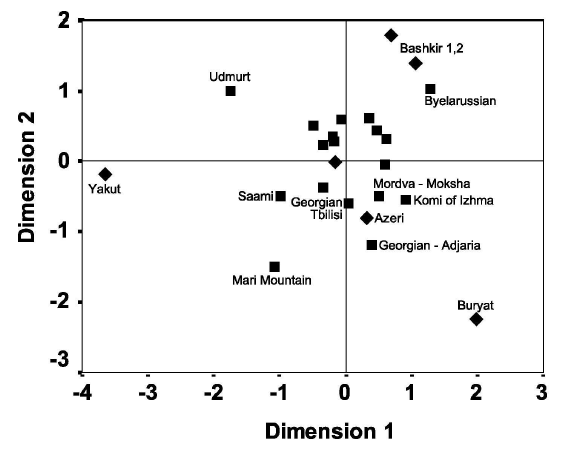 The Georgians and the Sami are also the closest two populations to the Mari Mountain outlier. This is suggestive of a South Caucasian origin for Uralic, with the Sami and Georgians experiencing more admixture with Russian and hence being more drawn to the Russian mean. Does anyone have the strs? You are only taking into account the Georgians of Tbilisi. Your hypothesis collapses when you also take into account the Georgians of Adjaria. The Adjarian Georgians are more distant to the Saamis than the Azeris are. 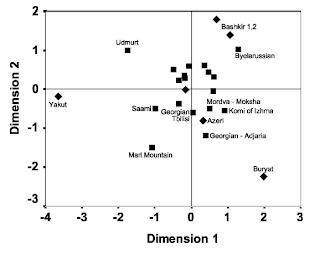 There isn't any significant difference between the Georgian (the average of the two Georgian populations) - Mari Mountain population distance and the Azeri - Mari Mountain population distance. The real amazing thing is how the Udmurts, Mordvins, Bashkirs, Komi people, Russians and even Byelarussians can be more distant to the Mari Mountain people than the Georgians and Azeris are, despite being geographically closer to the Mari territory. It is especially amazing how two neighboring Finno-Permic peoples like the Udmurts and Mari people can be so genetically distant to each other! Looking at these anomalies, two different explanations come to my mind: 1) Sampling is insufficient for some or all of the populations tested. 2) Y-chromosome is too flexible and unreliable as an indicator of overall genetic distance between populations. Of course both explanations can be partially true. We should not make any conclusions until we have access to the paper. Of course. I should have made that clear in my post. "Y-chromosome is too flexible and unreliable as an indicator of overall genetic distance between populations." Thats totaly what I think. 1. Y-Chromosoms are only half of the story. 2. Gendrift may be far stronger/faster than expected and totaly dismantle whatever we are trying to find out. I tell you, its astrology. Is reading tea leaves. Face it: this cloud is NOT a face. Even if it may look like it. Seriously,does anyone have the results? They would be very interesting. Y-Chromosoms are only half of the story. That would be over-optimistic. I think Y-chromosomes are not even a quarter of the story, maybe even much less. Worse still, there isn't a more or less fixed ratio of overall genetic diversity that we can confidently deduce from the Y-chromosome. These factors make Y-chromosome practically useless as a tool for measuring overall genetic diversity. We must make genome-wide studies, and whole-genome studies if feasible, to be able to learn something real about the overall genetic diversity and distances of populations. The point on the Azeris is well taken and doesn't really detract from the general concept that there is genetic similarity between very geographically distant populations. "Looking at these anomalies, two different explanations come to my mind: 1) Sampling is insufficient for some or all of the populations tested. 2) Y-chromosome is too flexible and unreliable as an indicator of overall genetic distance between populations. Of course both explanations can be partially true." I doubt it. When you have non-independent samples, like genetics drawn from a ethnically and linguistically homogeneous villages or cities, you can get away with smaller sample sizes than you can with a random sample. Also, the cultural distinctions of the Maki Mountain people, Sami and Caucasian populations makes you expect them to be outliers. The Maki are the last pagans in Europe. The Sami are the least settled people of Europe. The Caucasian language map is a widely divergent checkerboard where totally unrelated language families are spoken the next valley over. Discontinuities is isolated mountain relict populations in both language and population genetics are common. When old populations or cultures are wiped out everywhere else, they are likely to survive in the mountains. Dagestanis have majority J1 haplotypes despite being in the North Caucuses a distribution discontinuous with the Near Eastern semitic herders where this is also common. The Pyrenees, the Nuba Mountain (e.g. Kordofanian languages), the Caucuses and the Himalayas (e.g. Kusunda which is probably an Indo-Pacific language and its speakers are distinct in appearance from those in surrounding areas), all have relict linguistic popuations. The multiple languages and cultures of Switzerland are only possible with massive decentralization and weak central goverment (granting near sovereign autonomy to county sized regions). Andrew, until reading the full paper, our disputation on this study doesn't go beyond speculation. Still, my two alternative explanations deserve to be investigated in detail. have a high frequency of J and implies that the Mari do not. Honestly I don't think the two groups are closely related even when you consider y-chromosomes. If you want it I need your email. (unless you respond real fast). I've received it, thanks Curious. Curious, could you send me the paper too? Thanks.